Situated right on the Pacific ocean, the Kauri Cliffs offer breathtaking views. It’s been the home to the 2003 match between Fred Couples and Michael Campbell and the PGA Tour’s Kiwi Challenge, and has received numerous awards. 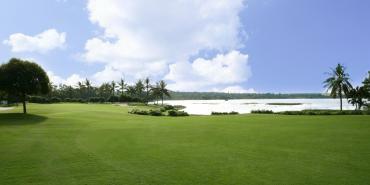 The course definitely is luxury destination with access to a Lodge and several beaches. In 2003, Tiger Woods and Ernie Els duked it out until nightfall over the President’s cup. After the match was closed, the cup was left contested for the first time ever. That yarn right there is enough for any golfing fan to want to visit Fancourt. That the courses are modeled on those of Scotland, were crafted with the consul of Gary Player, and are located in the gorgeous Garden Route is just icing on the cake. Vietnam has become a surprisingly popular spot for golfing. No doubt the weight of the USD there is one reason many flock to Vietnam, but there are also a number of timeless factors make golfing there worth it, namely: the variety of stellar courses there, how the beautiful greenery is juxtaposed right next to beautiful beaches, and the outstanding culinary history of Vietnam. Canada might not seem that exotic of a destination, but just because it isn’t separated by a large body of water doesn’t mean it’s not exotic. That said, Cape Breton is separated by a small body of water. With a history steeped in Scottish culture (it’s in Nova Scotia) Cape Breton has amazing seafood, amazing seafood, and amazing golf. Cabot Links is one course in particular worth exploring. What would your dream golfing destination be? There are hundreds of professional golfers throughout the world. Some have been competing for many years, while others have only been playing for a few years. With hard work, skill and determination a golfer can be considered one of the top players in the world. Many factors go into determining who is the top player like which tournaments they are playing in and how well they did in said tournament. I previously covered the top 5 players in golf. Although the order may shift according to official rankings, here’s a look at the rest of 2016’s top players. This Swedish professional golfer comes in at the number six spot. He competes in both the PGA and European Tours. He spent over 100 weeks in the world top ten. His highest ranking was second, but he is ranked the number one Swedish Golfer. One of his many accomplishments is the “historic double” where he won both the U.S. PGA Tour’s FedEx Cup and the European Tour’s Race to Dubai, in the same season. He was the first player to do this. The number seven spot is held by this Australian professional golfer. In 2013 he became the first Australian to win the Masters Tournament. In total he has won 29 professional tournaments. American professional golfer, Dustin Johnson currently has the number eight spot. One of his claims to fame is that he has one of the longest drives on the PGA tour. His career high on the list is third, which occured in 2015. One of his top performances came in 2015 in the WGC- Cadillac Championship. Coming in at number nine is this English professional golfer. He currently plays in the European Tour exclusively. One of his biggest accomplishments was winning the 2016 Masters Tournament. He is only the second Englishman to achieve this. Additionally he is the first European to win at Augusta National in a very long time. Finally number ten is this English professional golfer. He competes mainly on the PGA tour but he keeps his membership with the European Tour. Between the weeks of November 2007 and July 2008 he was considered in the top ten in the world. One of his best performances was in 2013 at the U.S. Open Championship where he placed first. There are hundreds of professional golfers throughout the world. Some have been competing for many years, while others have only been playing for a few years. With hard work, skill and determination a golfer can be considered one of the top players in the world. Many factors go into determining who is the top player like which tournaments they are playing in and how well they did in said tournament. Although the order may shift according to official rankings, here’s a look at 2016’s top players in golf. This Australian professional golfer is currently ranked number one in the world. The first time he achieved the number one spot was in September of 2015. He has been in the number one position for eight weeks now. He has competed in a total of 214 events in his professional career, placing first in 11 of them. His best performance was the PGA Championship in 2015 where he placed first and set a new record scoring 20 strokes under par. An American golfer from Texas takes the number two spot in the world. He has been excelling at golf from a very young age. He played his first professional tournament at the age of 16. He won two U.S. Junior Amateur Championships, which has only been done by two people (the other being Tiger Woods). The first time he reached number one in the world was June 2012. In 2015 he was named PGA Player of the Year. Currently number three in the world is this Northern Irish professional golfer. He is a member of both the European and PGA tours. He was number one in the world for 95 weeks, when he had the spot. He won his first European Tour in 2009 and a PGA tour in 2010. In 2012 he was the youngest player to reach $10 million in career earnings on the PGA tour. He has been named RTE Sports Person of the Year twice. Gerry Lester “Bubba” Watson, Jr. takes the number four spot in the world. The American golfer is one of the few left-handed golfers in the tour. In 2015 he reached his career-high of number two on the Official World Golf Ranking. One of his best performances was in 2014 where he won the Masters Tournament. He also won the Masters in 2012. The number five spot is currently held by Rickie Fowler. In 2007 and 2008 he held the number one spot for amateur golfers for a total of 37 weeks. Once he turned professional, his highest spot has been the fourth spot. One of his best performances came in 2015 where he won The Players Championship. In my next post I will cover 5 more outstanding golfers. As spring creeps into the days, it announces the arrival for golf once again. The long winter days have forced golfers indoors to the driving range or traveling on the weekends to warmer climates to get their golfing fix in. As a result of these warmer days approaching, it means days on the green, good conversation with friends and world famous golf tournaments. With a copious amounts of choices to watch, how do you narrow which ones to watch? Here are the four that I am looking most forward in the 2016 golf year. Eighty two years ago, the first Masters tournament was played at Augusta National. Labelled as one of the top four golf tournaments, it’s smaller than other the others as it’s invite only. With 90 to 100 best golfers in the world playing, the competition is stiff. Last year Jordan Spieth won by 4 strokes and claimed a prize of $1.8 million dollars. As he sets to defend his title, the Masters is full of surprises and excitement. The US Open Championship is the second major tournament where Jordan Spieth is set to defend his crown. Established 121 years ago at the Newport Country Club in Newport, Rhode Island, the US Open also brings out the world’s best players. Throughout the history of the tournament, Americans have won it for the majority of it’s lifespan, but in the past 11 years, only three Americans have taken the title. Since the tournament is not invited only, professional and amateur golfers are allowed to participate. The only guideline is that they must pass a certain set of qualifications. The Open Championship has been around for over 150 years. Required to take place within the United Kingdom, the tournament offers a unique golfing experience. Zach Johnson of the United States is the current champion and is set to defend his title this year. Open to both professionals and amateurs, the tournament is set over 72 hole course that spreads over a four day span. The last of the four major tournaments in the PGA Championship. Some argue that winning the PGA Championship is the most lucrative in terms of monetary gain and professional security. Winners of the tournament are invited to play in the other three championships for five years. Taking place on various courses throughout the US, the PGA Championship sets to celebrate their 100th year. Reigning champion Jason Day, of Australia, will return once again in July to play. The championship is usually set to play on Labor Day weekend, but was moved in order to accommodate the return of golf to the Olympics. For a full list of PGA tournaments click here! Thanks for reading and check back soon for new updates. Two years ago, the golf industry was rocked with articles stating how the sport wasn’t popular among millennials. After they came out in mid 2014, people speculated that golf was on a decline for various reasons. Outdated, too expensive or too stuffy were only a few reasons listed to why the sport was making it ways out. Yet, as the years since passed, it seems that people jumped the gun. In this current time, many of the world’s best and upcoming golf professionals are millennials. Jordan Spieth is a 22 year old professional golfer who is ranked No 1 in the world. He is the youngest player to ever win five times in a single season. The last time this occurred was in 1929 when a 21 year old golfer took the elusive title from golfers older than him. As Spieth was set to play over the weekend in the AT&T Pebble Beach Pro-Am tournament, people buzzed about his accomplishments and where he might place. To drive a buzz about his achievements, the eight thousand attendants of the tournament received Spieth bobbleheads. For those who were not in attendance, they were not left out of the celebrations. AT&T developed numerous comedy videos that started the Spieth bobblehead and put online for everyone to see. Such marketing tactics seem odd for the sport, but it played a small part in a bigger plan to draw the interest of younger golfers. Back in 2013, up to two hundred thousand millennials are have said to have left the sport. Since then, interest in the sport has been on rise due to the change in marketing and the amount of golf superstars that are millennials. The PGA has seen a 43 percent rise in it’s website traffic and Twitter increased by 39%. 6.5 million millennials are playing golf, which is around 30% of all golfers worldwide. As a way to get more and more people interested in picking up the club’s, various marketing teams have aimed to change their tactics to please the younger generation. By finding ways that capture millennials interests, there should be a direct correlation in the upward trajectory of more millennial golfers. As for Jordan Spieth at the AT&T Pebble Beach Tournament? Well, it wasn’t his finest weekend as he placed outside of the top 20. The bigger winner was middle aged Vaughn Taylor. The professional golfer turns forty today! He decided to celebrate the day despite the lingering questions about his future career that have been circulating the professional circuit recently. No one has doubted that Woods has been one of the greatest players of all time, but they do wonder if that spark will ever return to the now middle aged player. Tiger Woods was once ranked at the number one golfer in the world for around seven hundred weeks. Now, the golfer ranks at number four hundred and fourteen – which is quite the drop. He has not won a major since 2008, and a tournament since 2013. It’s hard to picture that he was once the golfer who won the Master by twelve strokes in 1997. However, in the past couple years, Woods has been plagued by numerous injuries, because of which he has to have various back and knee surgeries. As a result of these surgeries, Wood has moved to a new swing – which he has struggled with. Besides injuries, Tiger has had to deal with the fall out of his marriage for the past several years. In 2009, Woods dealt with a cheating scandal that rocked the mainstream media and the golf world in a way it had never seen before. He addressed the scandal in an interview with Time magazine recently, along with the idea that “he has reconciled himself to not playing again if it came to that”. However, that was a vastly different tune then to the PGA Tour blog, where he mentioned how excited he was for a return in 2016. The golf world has noted that it would be a different feel if he was no longer apart of it. After all, the golfer has broken and held many different records, and changed the face of golf for many Americans. For many, the return of Woods is an exciting idea. We can only wait and see what 2016 will hold for the golfer. In the meantime, once again, Happy Birthday Tiger Woods! Uh oh! Looks like your ball went right under that tree. Probably going to be a difficult shot. Normally this would be true but you actually have quite a few options at your disposal. It’s important to take a lay of the area in which your ball is situated and really understand what the surroundings are like. The last thing you want to do is rush a shot and end up having it ricochete backwards, or worse, break your club on the tree. I recently discovered this helpful video that taught me about the options I have taking shots from under a tree. Take a look and happy golfing! Driving the ball deep down the fairway is one of the biggest and most important parts of the game of golf. I know it has taken me many years to get as close to a perfect swing as I can get, but I am still learning the best stances for each course. Your drive can definitely vary in the event of inclement weather, altering clients, and many other factors. I wanted to highlight a a great video on learning how to really swing big and drive the ball really far down the hole. Have you ever got stuck in a bunker and not really been sure on how to get out? I know I certainly have and its no fun at all. There are a few tricks to properly striking the ball and lofting it out of the bunker and getting it close to the pin. No one likes landing in bunkers but they are a challenge everyone faces when they step onto the links. Take a look at this video I found to be extremely valuable for learning the tricks on how to bust the bunker. There was recently a breaking news story in the world of golf. The Los Angeles school district officials have confirmed that they have cancelled all plans to host a fundraising tournament at the Trump National Golf Course. The response came swiftly after Donald Trump made very crude comments toward immigrants and their relation to the United States. The Los Angeles Unified School District has asked for the return of the $7,500 deposit from the club, which is located in Rancho Palos Verdes, but the club has not as of yet complied with the request soon if they have not already. The golf tournament that was supposed to be held would have been the 8th annual “Beyond the Bell Golf Classic”. This tournament is held in order to raise money to support student programs that take place after normal school hours. Based on projections the tournament would have hauled in $70,000+ for all sorts of extra-curricular activities in the arts, music, athletics, and more. Since Trump announced his candidacy for President he has been quoted numerous times with inflammatory statements that have put off countless people. This is just one example of people responding back in their own way to Trump. I personally expect more news stories like this to pop up in the near future. © 2019 Belal El-Atari | The Golfer. All rights reserved.